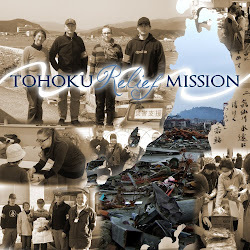 I know you all will support our very small attempt to do something about this situation in the tsunami-affected areas. There are so many great people doing stuff already, we want to see how we can go lend a hand and what we can get our friends back home to help with. Since we were basically just sitting at home itching to help, we're pretty thrilled to be able to go up and jump right in. On the first trip, Gene and I will be going with my dad and Nobuka Horii, certified disaster coordinators from Shizuoka prefecture. We get to ride on their coat-tails and work with them to distribute stuff that we've sent ahead: fruit, toilet paper, and toys for kids, etc. Gene and I will be taking our expert balloon-making services, and hopefully we'll be able to sing some Japanese folk songs to encourage people (which is probably the thing we're better at). The main purpose of this trip is to figure out what we can do, and how we can help better the second time we go up--what we can bring, whether more people are needed, etc. We'll leave to catch up with the Shizuoka team in a few hours, so wish us luck. I promise to update you every time I encounter an internet connection!! !